This book provides an account of how the "Theory of Attachment-Based Exploratory Interest Sharing" (TABEIS) and the practise of Goal Corrected Empathic Attunement (GCEA) was used in a university setting to support staff. It works in three ways; firstly, it raises attachment theory, one of the pillars of self-understanding, into a central place in terms of reflecting on and learning from the dynamics of business and organisations. Neath explores how well this attachment theory sits with other theories of self and relationships such as transactional analysis and the person-centred approach.Secondly, it is an account of how Neath took an application of McCluskey's theory "The McCluskey Model for Exploring the Dynamics of Attachment in Adult Life" to the University of Leeds, with learning points made along the way, exploring the practise of a therapeutic-style of group facilitation, and reflection on good practice for professional adult learning and teaching techniques. Thirdly, it acts as a handbook for anyone wishing to replicate Neath's work and includes feedback from participants both during and after the training process. It will appeal to those new to training, counselling, organisational developers and those wishing to enjoy and see the potential of the work of McCluskey. 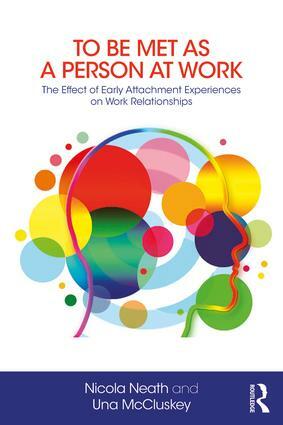 Chapter One The application, theory and why try it: Exploring the dynamics of attachment and their effect on wellbeing and creativity at work. Nicola Neath began practising as a psychotherapist in 2006. With over 20 years’ experience in public and private organisations, she continues to develop a relational approach to work, and is passionate about synthesising her knowledge of organisations and theories of psychotherapy for the wellbeing of clients and organisations. Una McCluskey is an Honorary Research Fellow at the University of York and a psychoanalytic psychotherapist. She is responsible for developing training for qualified psychologists, psychotherapists, social workers, GPs and others involved in the caring professions, who are interested in exploring the dynamics of attachment in adult life.